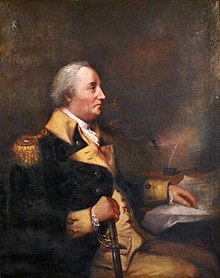 William Whipple, Jr. (25 January 1731 – 28 November 1785) was a signatory of the United States Declaration of Independence as a representative of New Hampshire and a member of the Continental Congress from 1776 through 1779. He worked as both a ship's captain and a merchant, and he studied in college to become a judge. He died of heart complications in 1785, aged 55. This year, my Friend, is big with mighty events. Nothing less than the fate of America depends on the virtue of her sons, and if they do not have virtue enough to support the most Glorious Cause ever human beings were engaged in, they don’t deserve the blessings of freedom. A recommendation is gone thither for raising some regiments of Blacks. This, I suppose will lay a foundation for the emancipation of those wretches in that country. I hope it will be the means of dispensing the blessings of Freedom to all the human race in America. This page was last edited on 31 July 2018, at 22:18.